I love breakfast food. Going out for breakfast or brunch is one of my favorite things to do. This time of year there are lots of reasons to get together for brunch – Mother’s Day, Father’s Day, families getting together for graduations and weddings . . . the list goes on. If you decide to host a brunch, this recipe just might be what you’re looking for. It’s a family favorite. My mother-in-law always makes it for us when we visit. She got the recipe from her friend Norma. It’s perfect because you make it the night before and just bake it in the morning. Serve it with a fruit salad, muffins or bagels and you’re all set. Enjoy! Bubbling, hot right out of the oven! 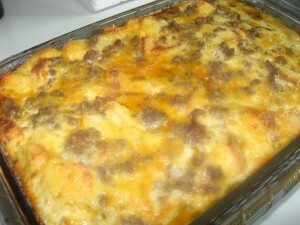 A tasty, hearty, and homey casserole for all to enjoy! Mix eggs, milk, mustard and salt. Stir in bread, sausage and cheese. Bake uncovered at 350F for 1 hour. I have a terrific recipe for a similar casserole (gluten free) and I now make it on Christmas morning every year. Easy, elegant and satisfying while allowing ME to enjoy the festivities as well! Personally, I’ll take your baked bacon over anything-anyday Kim! Yummy! You’ve got me wondering what this recipe would be like with bacon in it. I’ll have to experiment and let you know what I come up with. We had a great time enjoying all the food with our favorite relatives. Thank you for copying this for us. We are home now.